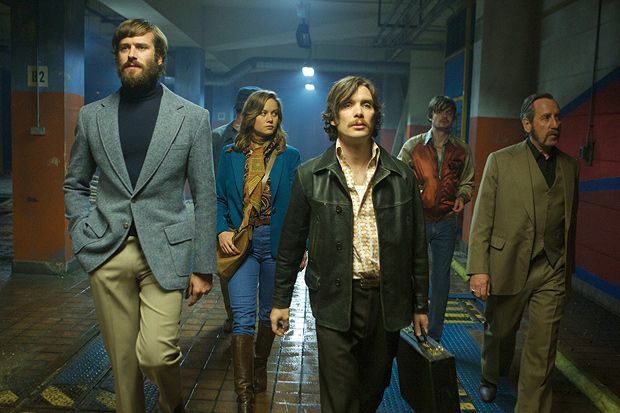 With guns a-blazin' and crooks cracking wise, Free Fire is the latest from Britain's own Ben Wheatley. Executively produced by Martin Scorsese and co-written by Wheatley's wife and regular collaborator Amy Jump, this single location, 70s-set actioner sees an arms deal go south fast, while Brie Larson, Armie Hammer and Cillian Murphy are amongst the trigger happy participants. Like Reservoir Dogs reimagined as a prolonged gun battle, we watch as a motley crew converge on a disused umbrella factory in Boston. Murphy is Chris, a member of the IRA looking to acquire some assault rifles and willing to trade a suitcase full of notes, Larson and Hammer play go-betweens and Sharlto Copley is the arms dealer Vern. When a previous altercation between minor players on each side (played by Sam Riley and Jack Reynor) comes to light, the abundance of guns proves terribly handy and the fragile relations descend into violence. With Free Fire Wheatley ends an extraordinary run which saw him direct Kill List, Sightseers, A Field in England and High-Rise. While he doesn't quite drop the ball with his sixth film, he does fumble it slightly. Unlike other action thrillers set primarily in one location (say The Raid or Assault on Precinct 13) there's not much at stake here, the action feels repetitive and it lacks the instantly iconic swagger of the aforementioned Dogs. The plot feels threadbare, even given that it's one long shootout, and double-crosses have little impact as the film trades instead in free-for-all chaos, with one character commenting, 'I forgot whose side I'm on'. Luckily a saviour is on hand in the shape of Copley as the flamboyantly attired, exuberantly preposterous Vern ('Watch and Vern!'). Riley too is a hoot, as the anarchic instigator who, as events wear on, increasingly resembles Animal from The Muppets. There's some terrific writing here ('Vernon was misdiagnosed as a child genius and he never got over it. '), aided by precision delivery from a cracking ensemble, meanwhile the filmmakers have fun with the period trimmings – beards abound and big collars and bold patterns are everywhere. Pleasure can be derived from these details, yet the film runs out of ideas long before its (modest) runtime is up. Still, devotees of facial hair and firearms are likely to have a blast. Screened as part of the London Film Festival 2016. General release from Fri 31 Mar.